The first edition of The Post Reality Show: TALK MEDIA! was presented by the 7th Annual Capital Fringe Festival, the first ever netcasted, online performance at the Fringe (how fringe can you get?). The show aired via Livestream July 17-20 & 24-28, 2012. The Post Reality Show: TALK MEDIA! pushed the limits of late night talk into the realm of the surreal, the disturbing, the bizarre, and the telematic: a non-stop-situational-electronic-talk show with multimedia, electronic music and a provocative lineup of guest artists discussing the hidden mechanisms of contemporary media culture. The Post Reality Show: TALK MEDIA! dissected the heretofore indefinable nature of the post reality, while exposing it to anyone and everyone. The revolution will be net broadcasted. 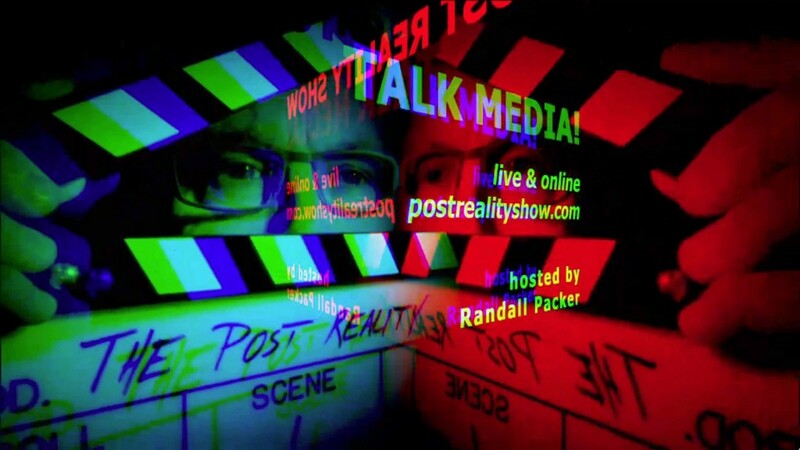 The following are excerpted interviews from The Post Reality Show: TALK MEDIA! For the debut show, we return to the desert: a place of dislocation, magic, survival, madness, radiation, and sub-sea-level euphoria. Guests: Charles Lane, Eve Andree Laramee, Orf. Fly in the face of power and place yourself squarely in the “I” of the storm. When you find yourself peering over the brink, where else is there to go? Guests: Mina Cheon, Yauger Williams, Hasan Elahi. Performance is truer than reality. Make your own reality. Rupture reality. Intent is everything. In the post reality, that’s all you need. Guests: Ken Jordan, Melissa Ichiuji, Kathryn Cornelius. Inhabit Facebook, surrounded by a cast of a thousand friends, an archive of everyone you have ever known! No one and nothing will be left out. Jeff Gates, Philippa Hughes, John Anderson. Crash and burn in feverish disinformation. The critique of the media should allow for its intoxicating embrace. Guests: Craig Saper, Rex Weil, Max Kazemzadeh. Let’s induce an alchemical transformation of the senses. You see, alchemy is an act of falsification, somewhere between the danger of knowledge and the promise of power. Guests: Tom Leeser, Ramon Sender, Marisa Olson. In the glow and glam of the spectacle, break down the elements of seduction, one at a time, an endless stream of manipulation and desire. Guests: Alberto Gaitán, Victoria F. Gaitán, Philippa Hughes. Life in America is a spectator sport. You are the movie. No script, no beginning, no end. Become the narrative that is happening all around you. Guests: Helen Thorington, Lisa Moren, Jonah Brucker-Cohen.